First Sentence: I won’t waste any time asking how you’ve been, because I know, and I don’t much care. Reason for Reading: This is a Harper Collins First Look book I was selected to preview. I put my name into the drawing to read it because the synopsis caught my interest. Comments: It is rare that I read a book in a series out of order, but when the opportunity arose to preview Mark Billingham’s latest, I decided to give it a try. 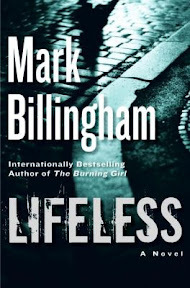 Although at times I felt that I was missing some of the back-story to the characters and previous cases that haunted some of them, I had no trouble following the story in Lifeless. It is a book that touches on topics relevant to today. Right from the beginning, it is clear that the main character, detective Tom Thorne, is going through a rough patch in his life. His father who had been suffering from Alzheimer’s recently died in a suspicious fire and his superiors thought he had come back to work too soon and put him on a desk job pulling together inane statistics. Recent murders among the homeless population in London seem to have the authorities stumped and Tom Thorne sees this as an opportunity to go undercover to see what he can find out. While his superiors suspect they’ve got a random serial killer on their hands, Tom has other ideas. He believes the killer has a distinct purpose and is targeting specific victims. Tom finds he fits in quite well on the streets among the junkies, boozers, and mentally ill. It becomes more important to solve the crime quickly when it appears Tom’s cover may be blown. Tom and his team have their work cut out for them as they find all the pieces and begin to put them together in hopes of finding a killer and his purpose behind the crimes. I haven’t had the privilege of reading too many British mysteries other than Anne Perry and P.D. James novels among a scattering of others. I enjoyed Mark Billingham’s gritty story telling style. He stepped inside the homeless community and brought them into a more personal light, reminding readers that they are in fact just like everyone else. The novel also touched upon the topic of homelessness among soldiers. Between one and three to one in five have spent time in the armed forces in the United Kingdom. I don’t doubt that the number of former American soldiers is just as high. While there are some services in place to try and avoid this problem, it is obviously insufficient and not nearly enough. I will definitely be reading the previous books in the series. Mark Billingham has a new fan of his Tom Thorne series. Favorite Part: At one point in the novel, Tom is having a conversation with his colleague and they are discussing how close they are to being on the streets themselves. Two paychecks, he says. How true this rings for many people in today’s society. Miscellaneous: I was actually supposed to read this book back in May, however, there was some sort of printing or shipping error that delayed the book being sent to me. I am glad it finally arrived!